European programming centre offering IC programming service with device storage and handling approved by all of the major semiconductor manufacturers. 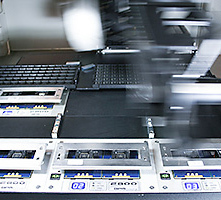 Specialists in the tape and reeling of surface mounted semiconductor devices. We accommodate tube to tape, tray to tape, and tape to tape. Baking and re-packaging services to manufacturers specifications. We operate very strict component handling procedures, which incorporate dry packing / moisture control systems. If you require waffle trays for re-packaging complex semiconductor devices, then we may be able to offer a quick solution. Action Circuits offers a wide choice of laser marking, ink marking or labelling of devices. Stockist of a comprehensive range of antistatic packaging materials. Action Circuits (UK) Ltd was formed in 1987, and has been specialising in offering device programming and reeling services since 1990. 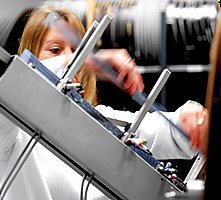 We are one of the largest service providers in Europe and in a very strong position to continue to service the requirements of the electronics industry. We have a policy of recruiting and employing a high calibre of staff throughout the company. We believe that our commitment to keeping a well motivated, and highly skilled team is the key to our ability in offering unrivalled customer service. All of our staff are not only trained in the technical and quality aspects of the services that we offer, but are also aware of the time constraints that most orders are subject to. This gives us the opportunity to offer a very fast turnaround on all orders, at no extra cost and with no compromise to quality. Action Circuits device programming centre also offers component taping services and component laser marking services with certification to ISO9001:2008. In addition to chip programming and tape and reeling of SMD parts we also offer laser marking onto electronic components, repackaging of parts from from tube to reel, stick to reel or tray to reel. We also hold approvals from the majority of Silicon Manufacturers, large OEMs, automotive and contract assembly services in the UK and worldwide for our automotive approved chip programming and reeling service. With a strong financial base, we are in a position to develop partnerships with our customers and make the relevant investments, which will place both companies in a confident position to commit to any new business in the future. If you have a requirement for electronic component programming or need to tape and reeling loose SMD components onto reels, then please fill in the questionnaire which will be e-mailed directly to our sales team, or call them directly on +44 (0)1582 412323. If you are looking for a professional approach, from a company who are always looking to offer the service levels that you require, then contact Action Circuits now. We are sure that you will receive a turnaround and quality of service that exceeds your expectations.